Adapting digital strategies can act as building blocks for Nonprofits to help generate viewership, awareness and outreach. 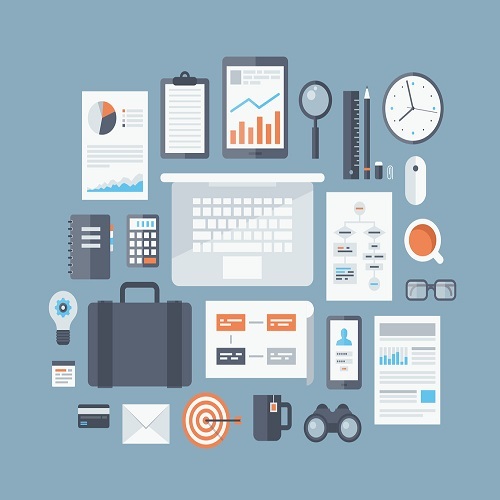 Non-Profit Quarterly in its survey of ‘State of the Nonprofit Sector’ in United Kingdom reports that 35 percent of the surveyed nonprofits use digital technologies but don’t have a strategic approach. An additional 12 percent are in the thinking stages of a digital strategy, with three percent are still struggling to access basic tools. The report highlights that nonprofits are desperately seeking digital leadership and looking for ways to enhance their skills of using digital tools which could help them achieve more. Embracing Digital tools changes how nonprofits connect with clients and create value with their stakeholders. When Non-profits reduce Digital barriers, their mission and its role in the current market place of ideas and services is better showcased. Adopting simple digital tools can be a game changer for Nonprofits. They can capitalize on increasing online awareness, fundraising campaigns and escalate their online visibility. Madeline Turner, an Online social and Marketing manager states in npENGAGE that “digital tools at our disposal are not just avenues for us to talk at supporters but to gain a better understanding of who our supporters are, what matters to them, and how we can work collectively to activate real change”. Having realized the unqualified need for adopting digital tools, many Nonprofits are dedicated to making technology accessible, affordable, secure, and simpler for everyone. The Harvard initiative KoBoToolBox is an open source suite of tools for data collection and analysis for humanitarian emergencies and challenging environments. In order to safeguard humanitarian organization’s security and privacy, Nonprofit The Guardian Project has created secure apps, open source libraries, and customized mobile devices to safeguard online work from interception and regulate monitoring. 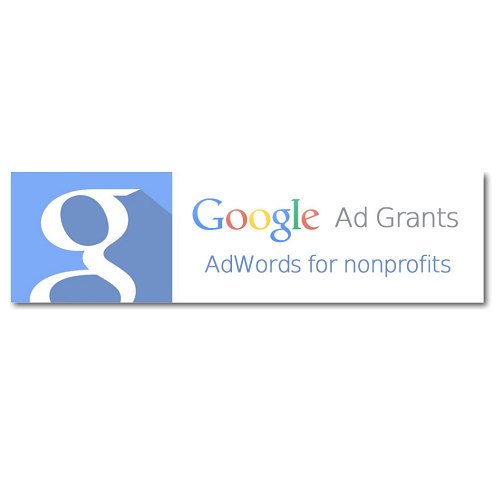 Google gives a $10,000 monthly grant periodically to Nonprofits who want to advertise their cause on Google. It will show search ads to people searching Google for Nonprofits and helps to reach people who were unaware of your cause. This has a potential of driving 10,000 to 40,000 new visitors a month to your website. The mission of Science Buddies is to help students from all walks of life to build literacy in science and technology. 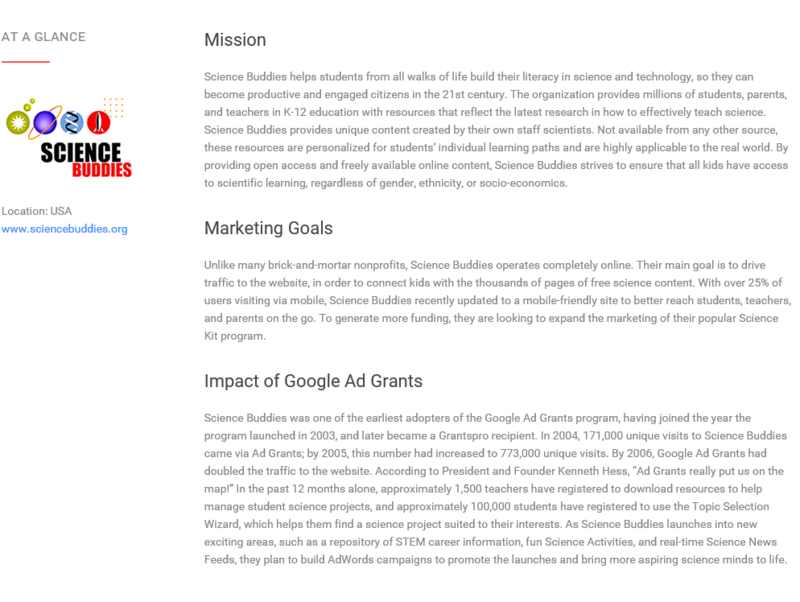 In 2003, Science Buddies was one of the earliest adopters of Google Ad Grants and by 2006, the traffic to the site was nearly doubled with registered 1,500 teachers and 100,000 students and 18.2 Million web clicks. G – Suite is a Google application which brings a host of essential services like Email, Google Drive, Google Docs, Google Calendar, Google Talk in one domain. This includes 30GB of storage on Gmail and Google Drive, a cloud-based document-sharing, creation tool and 24/7 support for any technical issues or questions. It makes sure that everyone stays connected with video conference calls that host up to 25 participants. When your staff is dispersed across various geographical boundaries, you can share and store information securely with Google Drive, communicate online with people in various countries with Gmail and stay up-to-date on events with Google Calendar. Samasource founded in 2008 proactively works to reduce global poverty by connecting marginalized people to dignified digital work. It operates in five countries and to communicate across the globe, Samasource took full advantage of G Suite. Google Docs was used to collaborate on a single document, Google Drive was used to store files which resulted in streamline workflow and ensure that its 1,000 workers were able to access files, documentation etc. 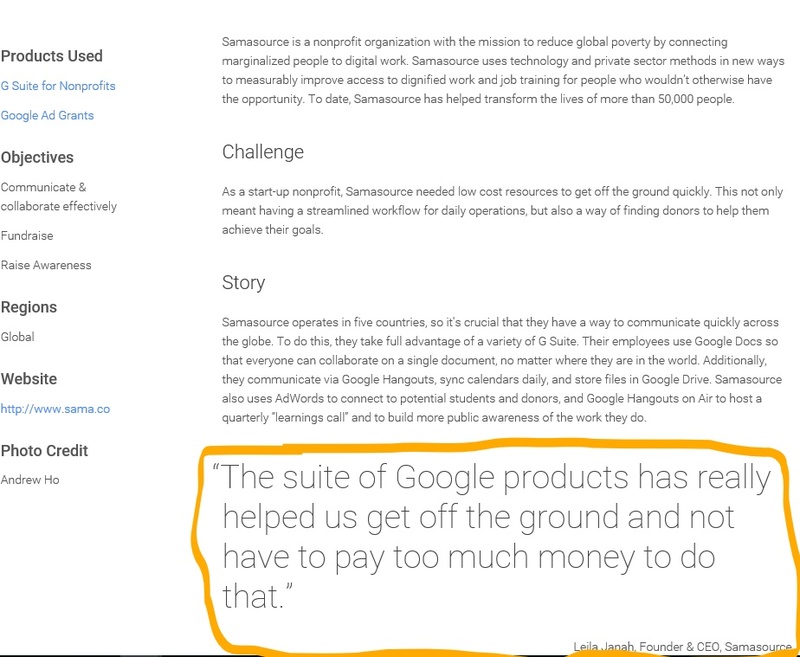 The founder and CEO of Samasource shares her experience as to how the usage of Google Products entailed in smooth daily operations by not paying much. This digital tool gives life to the nonprofits objective and work. An appealing story connects with supporters, volunteers and donors. Videos are a great medium to connect with a large community of audience and gather support. The Huffington Post in 2013 had stated that You Tube has 1 Billion active users each month. You Tube focuses on content targeting which raises awareness and enables people to engage with the cause. 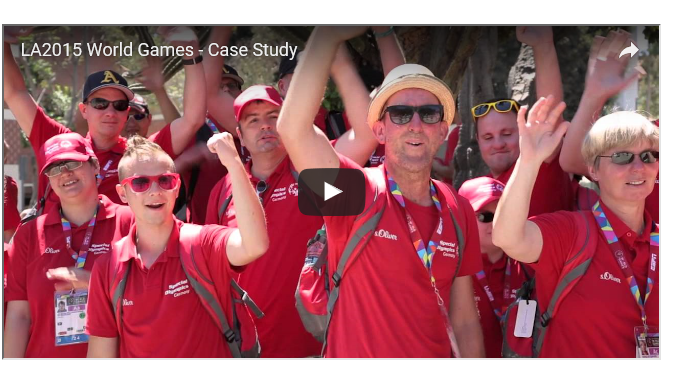 For the Special Olympics World Games the challenge was to organize 30,000 volunteers, 500,000 spectators, and tens of millions of dollars in donations. And You tube impact generated 44% of new users and drove half of their new subscribers to sign up. 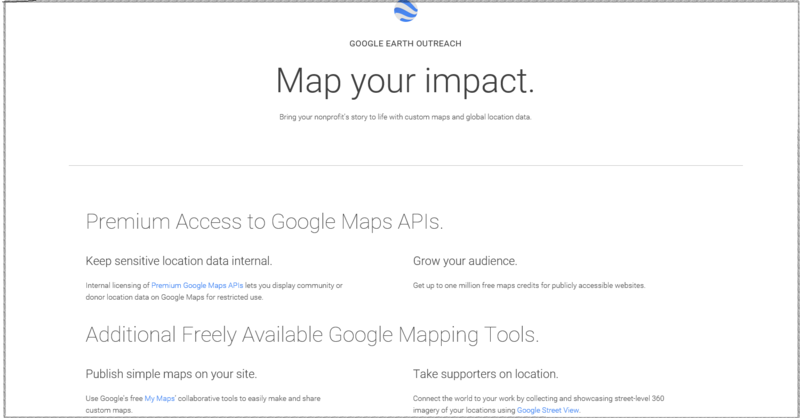 This mapping tool includes Google Earth and Google Maps and allows supporters to see Nonprofit’s work. One can create a custom map of the various project sites in 10 minutes and add a narrative Google Earth movie and make it available on YouTube. This tool enables to collect data in the field with Android devices, Open Data kit and map your data. Online tutorials can be viewed to facilitate the learning and usage of the available mapping tools. Crowdrise, a crowd funding platform is designed for Nonprofit fundraising. It is exclusively for charity fundraising. It is an innovative, cost effective fundraising website. Its impact is seen in 2017 Boston Marathon, when 139,200 Donors raised $26, 414,995. 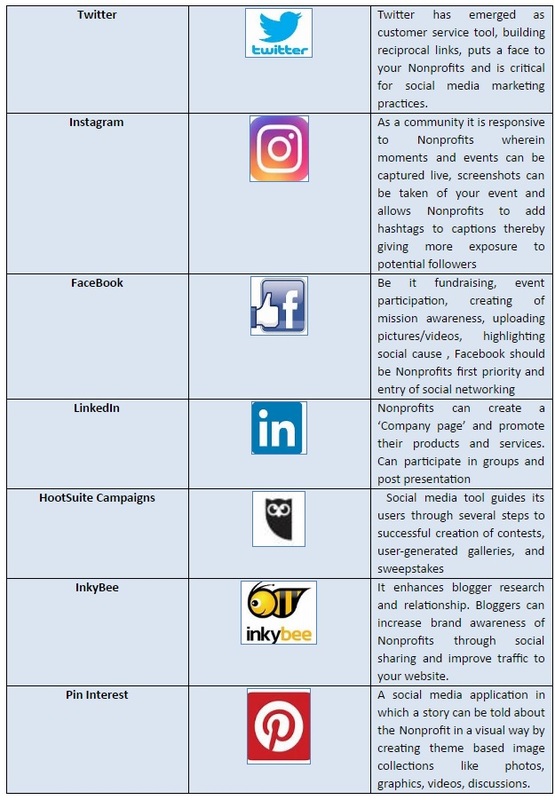 There are several online digital tools for Nonprofits which shall expand their prospects and also effectively increase their productivity. This website is a directory of quotes and lists thousands of inspirational quotes which Nonprofits can use for Tweeting and as Facebook Status Updates. This will surely escalate the Nonprofit’s social media page. 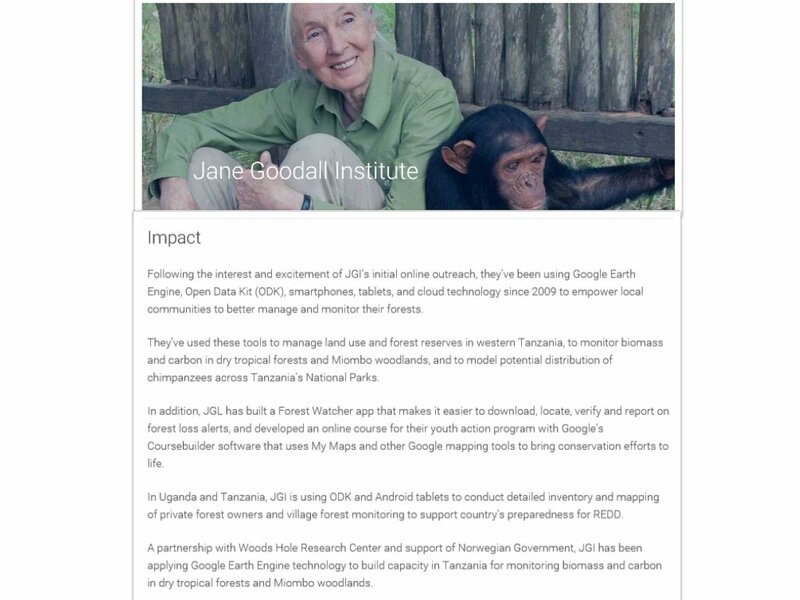 World’s largest petition platform wherein Nonprofit can engage in advocacy and the mobile website enables Nonprofits to make their online advocacy campaigns mobile. Giving Library is a portal created for nonprofits to enable donors and supporters to easily learn more about the nonprofits they support or are considering supporting. Nonprofits can create informational videos explaining their work, mission, accomplishments and future goals. MobileCause is a mobile service provider exclusively for Nonprofits and is available at affordable price for group texting or mobile fundraising. An easy-to-use, affordable tool that allows Nonprofits to host group video calls and group meetings via screen sharing for a low annual fee. It is most helpful if staff is located in multiple locations or a remote staff that works from home. It’s a powerful search engine optimization tool. It’s also experiencing an explosive growth of over 100% and Nonprofits can share about themselves through social presentations, infographics.